Mechanical wristwatches employ spring drives for their motive power. Typically, such watches must be hand wound every two or three days to insure continuous operation. An advanced version of the mechanical wristwatch is the “automatic” or “self-winding” mechanical watch which employs a built-in rotary pendulum mechanism to wind the spring. 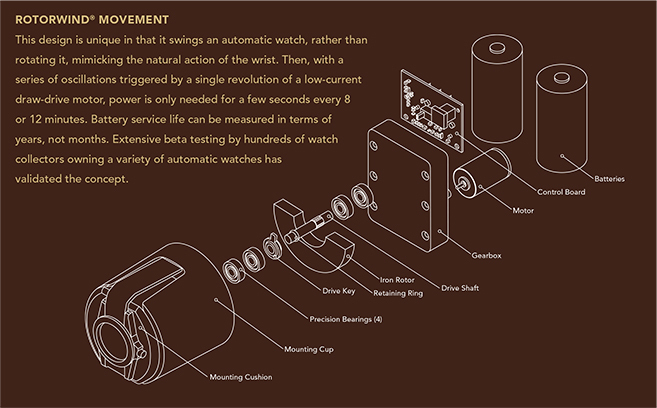 The rotary motion being generated is by the random wrist movement of the user as he or she engages in normal daily activities while wearing the watch. Generally, the rotary pendulum mechanism swings through an arc of 30 to 60 degrees as the wearer works or walks and swings his or her arm. As long as the watch is worn, the mainspring stays wound and the watch runs continuously. The mainspring stores sufficient energy to power the watch and keep perfect time. However, when unworn, after about forty-eight hours, the mainspring fully unwinds and the watch stops. Many automatic watches not only keep time, they also provide “complications” such as day and date (the calendar watch), or, in more sophisticated automatic watches, display month, year, leap-year, lunar phase, tide time, elapsed time, world time zones, etc. Naturally, each additional complication also consumes some spring power and further reduces the operating time between windings. All such watches, when fully unwound, must be reset in order to wear them. Just resetting the time, date and a day can be annoying. As the number of complications increase, do does the task of completely resetting the watch. Frequently, owners of automatic watches have more than one watch. They may have a stainless-steel watch which is used for sports events, swimming, diving, etc. They may use another watch for normal daytime office or business activities and yet another for evening or formal social events (frequently, a gold watch). Clearly, the task of keeping several watches continuously wound can be challenging and many multiple watch owners employ one or more watchwinders to accomplish the task. A watchwinder is a powered device designed to keep an automatic watch fully wound, eliminating the need for manual rewinding and resetting. It generally employs electric motor drives and gearboxes with one or more spindles terminating in a watch mounting arrangement of some sort; a metal spring device formed in a “C” shape over which the watch is fitted, a latex or leather cushion or some sort of screw or spring tensioning device to support the watch. The watch, when mounted, rotates in one direction or the other with the rotation axis being the center line of the watch (more or less). Therefore, the watch rotates in the same plane as the hands of the watch. Some versions also employ timers or programmable controls so that the winding action is not continuous. Continuous rotation of an automatic watch increases wear and tear of the winding mechanism components. Typically, motion of the wearer’s wrist when walking or working is only intermittent. Obviously, some watchwinders do not replicate this human motion. Buyer beware….your expensive watch could be at risk! The ORBITA watchwinder employs a unique and safe design concept for watch winding. Our design employs a solid-state microprocessor which controls a DC gear motor which is battery or AC powered and which intermittently drives a rotating cup. The cup carries the cushion mounted watch and rotates for a short period of time (one or two minutes) and then “goes to sleep.” The sleep period is easily programmed by the user based on the make of the watch. Typically, the time controls turns per day (TPD) of 650, 800, 900 and 1300 TPD. This provides sufficient motion to keep the watch wound while, at the same time, eliminating any concern of over-winding. 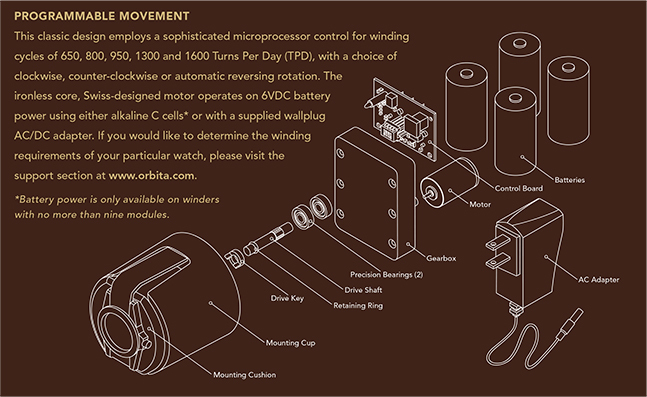 For watchmakers or multi-watch collectors, ORBITA watchwinder with several independent motors and mandrels can also be supplied. Generally, each station has its own separate control. Please request further technical information from our factory.